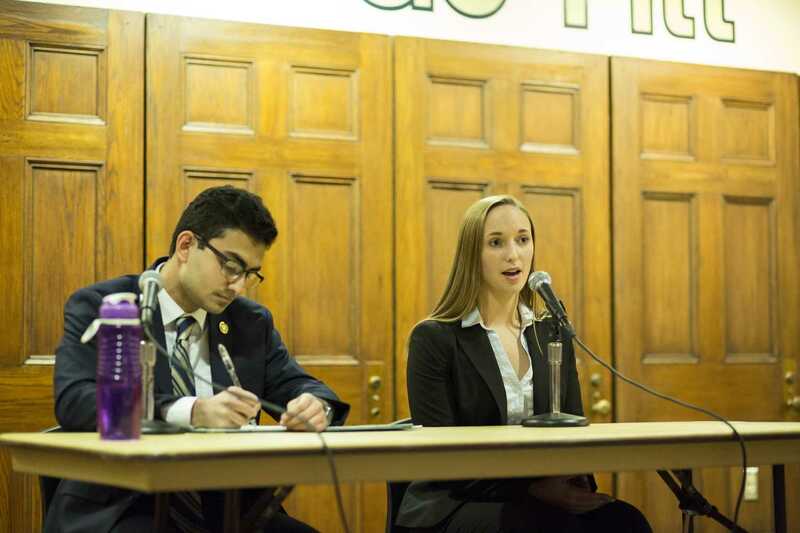 Maggie Kennedy and Saket Rajprohat met Monday night to debate for one of the most influential student leadership positions on campus — the Student Government Board presidential seat. The duo showcased their knowledge of the Pitt student community along with their qualifications for holding office. Tabitha Barnes, vice chair for SGB elections, and Henry Glitz, opinions editor at The Pitt News, moderated the debate in the William Pitt Union. Along with the presidential candidates, each slate had three minutes to give opening statements and two minutes for closing statements. Legacy slate mentioned safety, health and wellness and 582 Bridges talked about improving the Wi-Fi system and SafeRider. Kennedy, SGB’s current Wellness Committee chair who is running with the Horizon slate, emphasized the issues of sexual assault and sexual violence. Rajprohat, a junior marketing major running with the Neighbors slate, spoke on gender-neutral bathrooms and male and female hygiene products. Following introductions, the candidates had two minutes to answer each question and debated topics such as the most important duty of the SGB president and advocating for the student body. Kennedy said the top priority of the president is to act as a unifying voice. “I think the most important thing is that that president is someone who is in touch with that student body, knows what students need and is really willing to work with students across organizations, across years, across all sorts of differences to best serve them,” Kennedy said. Rajprohat said it’s important to acknowledge student concerns. He also said it’s crucial for the president to be able to approach the administration about those concerns. “As President, I think the most important thing is to understand that you’re not there for yourself, but you’re there to represent the 19,000 students here and represent their concerns,” Rajprohat said. Current SGB President Max Kneis said what Kennedy and Rajprohat mentioned go hand in hand with the president’s most important role. “ I consider myself a connector between a lot of different administrative offices and students within SGB. I think both candidates capture the primary role very well,” Kneis said. The moderators also questioned the presidential candidates on how they would advocate for diversity and increase student interaction in SGB. Rajprohat said listening to organizations from the Office of Cross Cultural and Leadership Development, such as Black Action Society and Asian Student Alliance, would help. “It’s moreover for me to listen, for our board to listen … to those people, and to make sure that we’re able to convey those concerns in an appropriate and proper manner,” Rajprohat said. Kennedy said getting more international students on First-Year Council — a group of first-year students who want to be involved with SGB, improve student engagement and assist committee members — and other SGB committees would help this. “When we’re planning something for Mental Health Awareness Month, we want to take into consideration how these issues vary across cultural differences and make sure that we’re being accurate, comprehensive and inclusive in our approach,” Kennedy said. Kennedy repeatedly emphasized sexual assault and sexual violence awareness. She said her involvement with the issue stems from her senior year of high school when she lost a close friend to suicide because of sexual violence. After the debate, Rajprohat mentioned he did not prioritize one issue over another. When his slate spoke in the beginning, though, he mentioned gender neutral bathrooms and making male and female hygiene products more available. “When I decided to run it wasn’t like a calculated thing, it’s just things that … I heard other students be concerned about,” Rajprohat said. Attending students also posed questions via paper slips available on the table stationed in Nordy’s Place upon entering the debate. One question selected asked how the candidates would handle time management and if they could deal with the workload of the president’s job. Both candidates said they have experiences that have allowed them to develop time management skills. Rajprohat said he realized he needed to make sacrifices such as quitting work to dedicate himself fully to one thing. Kennedy said her involvement with groups like SGB and the Office of Sexual Harassment and Assault Response and Education helped her with managing time. This is the second SGB event for this election, and host Andrew Dow from the SGB Meet the Candidates Jan. 31 event, came out because he felt he should get more involved with SGB happenings. He said between Meet the Candidates and the debate, though, he noticed a difference in the candidates. “They seem more serious,” Dow said.